QC PATINA STAINS are various combinations of metallic salts in water-based solutions that are slightly acidic. The stains lightly etch and penetrate “bare” new or existing concrete and chemically form permanent insoluble colored precipitates that remain in the concrete’s pores. These stains may also be used to treat other cementitious materials (such as terrazzo, certain self-leveling and other toppings, gunite, shotcrete, stucco and cement plaster) as well as natural stone with a chemistry similar to concrete, i.e., marble, limestone, etc. QC PATINA STAINS produce a variegated patina look, similar to the patination of bronze or the natural oxidation of copper. There are no pigments in QC PATINA STAINS. This is not a paint or coating. QC PATINA STAINS do not “cover up”, but rather work in conjunction with the color tones of the substrate. A variegated finish, including broad drifts in color, is not considered a defect, but is the reason this method of concrete coloration is chosen. This is an “old world” method, most popular around the turn of the 19th century. There are eight standard stains available, which may be diluted or applied over one another to expand the palette for modifications. (See Directions For Use). On new projects, concrete may also be colored using QC COLOR HARDENER or QC INTEGRAL COLOR, which will further expand the QC PATINA STAIN palette. A wide variety of artistic and graphic effects are possible and a QC representative can provide an experienced contractor or artisan reference. It is recommended that QC PATINA STAINS are applied over concrete that has attained a full 28-day cure. However, stains may be applied over concrete with less curing time, but unpredictable results may occur. Blue/green colors are subject to blackening in the presence of moisture. Concrete that is to be stained should be cured using water or high quality curing paper. Do not use curing compounds or plastic sheeting. The entire surface should be cured in a consistent manner. The substrate must be bare, free of all debris and contain no material that would act as a resist to the stain. It is recommended to test the surface to be stained for the presence of sealers, curing compounds or release agents. Mist the surface with a hand-held spray bottle. Potential problem areas will not “wet out” uniformly. Extremely dense/burnished floors may need to be lightly abraded to better accept Patina Stain & Finish Sealers. QC CEMGUARD (see Product Information Bulletin) may be applied to the concrete to achieve a more uniform coloration and to uniformly harden “soft” surfaces. QC CEMGUARD will also prevent potential problems due to sub-surface moisture. Stain is generally applied through an all plastic pump-up type sprayer or hand-operated sprayer at a rate of 200-400 square feet per gallon (18.6 – 37.2 sq. m per 3.8 L) per application. This is followed by massaging stain into the surface with a stiff nylon-bristled brush in a circular motion. As stain is applied, various degrees of acidic reactions will occur (fizzing & foaming). This is generally a sign that the substrate is accepting the stain. Stain should always be applied in two or more applications*. Do not rinse stain between coats. After the first coat has dried (5 hours minimum), additional coats can be applied. Any modifications or applied combinations of QC PATINA STAINS are done at applicator’s risk. To avoid any unevenness, “brush-out” any excessive puddles. After the final coat has dried (or after at least 10 hours, dense/burnished floor will require more time), remove salty residue by spraying with water and agitating with a stiff nylon-bristled brush. A rotary floor machine with a pad driver and soft pad may be used. Rinse until rinse water runs clean. Rinse water may have an additional coloring capacity. Control and/or collect run-off to keep from discoloring surface not to be stained. Be sure all surface residue is removed prior to sealing. Squeegees and/or wet-vacs are recommended. Under normal circumstances, rinse water should be collected and disposed of properly. Always consult Material Safety Data Sheets and appropriate agencies for disposal information. *This is an example of a typical application on concrete flatwork. Consult your QC representative regarding the applications. 8 standard colors: Adobe, Blackfoot, Bluegrass, Buckwheat, Ember, Jade, Kodiak, Neptune. 200-400 square feet per gallon (18.6 – 37.2 sq. m per 3.8 L) per coat. Coverage will vary depending on finish and age of concrete. 1, 5 & 55 gallon (3.8, 18.9 & 208.2 L) units. Allow one week for 55 gallon (208.2 L)units. Approximately one year. Keep at 40°F (5°C) minimum. It is highly recommended to develop and follow a routine maintenance schedule for all colored concrete so that it will maintain a top quality appearance. Maintenance sealers should be used on a periodic basis depending on traffic. The need will depend on a number of factors including traffic conditions, geographic location and weather. Patina Stain Floors should be routinely swept and damp mopped of dirt/loose debris to avoid unnecessary wear to the surface. Job site samples using the proposed QC PATINA STAINS, application procedures and sealing products should be done prior to application to better anticipate the results. For existing slabs, it is strongly recommended to sample the actual surface to be stained in an inconspicuous area. 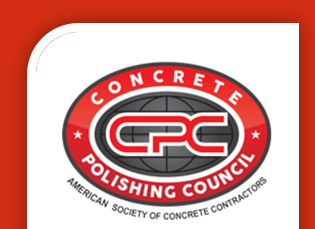 Inconsistencies in job site conditions, finishing practices, concrete mix design, slump, curing methods, stain application, age and condition of the concrete in existing slabs, base color and surface porosity may produce variations in the color of the finished product. In particular, blue and green based stains will react to the presence of moisture and will create a black, spotty effect to the color. Photos in our brochure and sample color chips provide a good representation of our palette, but the actual colors achieved may differ significantly.